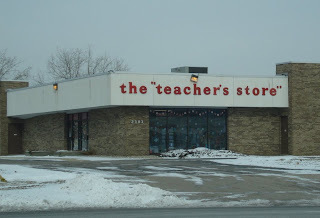 When in beautiful Sterling Heights, Michigan, please visit The "Teacher's Store." While there I'm "sure" you will "find" something you like, and even "learn" a thing or two...such as when and when not to use quotation marks. Quote marks seem fine to me too here. I drove past this store last week or so to find that it, too, had fallen victim to the listless economy. Now there are two fewer quotation marks to distract you, though I'm almost certain someone, somewhere will be making up for it soon enough.